A blowup over the crisis in Kiev is the last thing that Obama needs. The last thing that President Obama needs right now, as he struggles to finalize an accord with Iran and get the peace conference on Syria up and running next month, is a showdown over Ukraine. But he might just get one. The three-week-old crisis there is teetering on the brink of something far worse, as protesters vow to expand their demonstrations and security forces threaten a general, violent crackdown. Despite signs that the government in Kiev may be trying to negotiate a resolution to the standoff, and despite nationally televised talks between Ukraine’s President Viktor Yanukovich and his three predecessors, there’s enormous potential for uncontrolled violence. The best way Europe or America can help Ukraine—and Georgia and Moldova—is to take a much tougher stance with Russia. The EU may not want to play geopolitics. But geopolitics is being played in Europe, and EU interests and members are at stake. The EU should freeze Russia’s request for visa-free travel for holders of “official” passports. America and EU countries should also freeze Russia’s application to join the Organization for Economic Cooperation and Development, the Paris-based good-governance club. The EU should intensify its scrutiny of Gazprom’s behavior in the European gas market, and pursue its upcoming antitrust “complaint” (in effect a prosecution) against the Russian state-owned giant with the greatest vigor possible. It is time to show Mr. Putin that his hunting license in Russia’s neighborhood is now canceled. But Lucas isn’t confident that anything like that will happen. “Don’t hold your breath,” he concludes. After days of playing down the crisis in Ukraine, the United States has lately upped its involvement, with Vice President Biden calling Yanukovich and Victoria Nuland, a quasi-neocon who serves as assistant secretary of state, dropping in on Kiev to contribute her two cents. The crisis began when Yanukovich, under severe pressure from Russia, opted not to sign an agreement with the European Union and instead signaled his decision to join an economic pact linking Russia and a handful of former Soviet states. Earlier this year, Russia threatened to bring Ukraine to its knees via a trade embargo and other measures, taking advantage of the fact that Ukraine is heavily dependent on Russia economically, and it is near bankruptcy, needing an infusion of something like $18 billion to stabilize itself. The accord with the EU, accompanied by the usual demands from the International Monetary Fund, would force Ukraine to accept stringent economic austerity measures to qualify for aid, and the EU also wants Yanukovich to free political prisoners, including an imprisoned former prime minister, Yulia Timoshenko. Russia, on the other hand, won’t come to Ukraine’s aid until and unless it gets assurances that Ukraine won’t become part of an EU-NATO alliance against Moscow. So, as long as Ukraine is caught between east and west, Cold War–style, it’s unlikely that either side will come to Ukraine’s aid economically. Russia has indicated some willingness to help, potentially with a combination of lower gas prices, the refinancing of existing debt and, perhaps, a small bridge loan, but not until the political turmoil has been resolved. … The possibility that Ukraine could be tipped back into Russia’s orbit has set Western officials scrambling, in part to put together a more palatable aid package that perhaps would persuade Mr. Yanukovich to reconsider signing the accords. 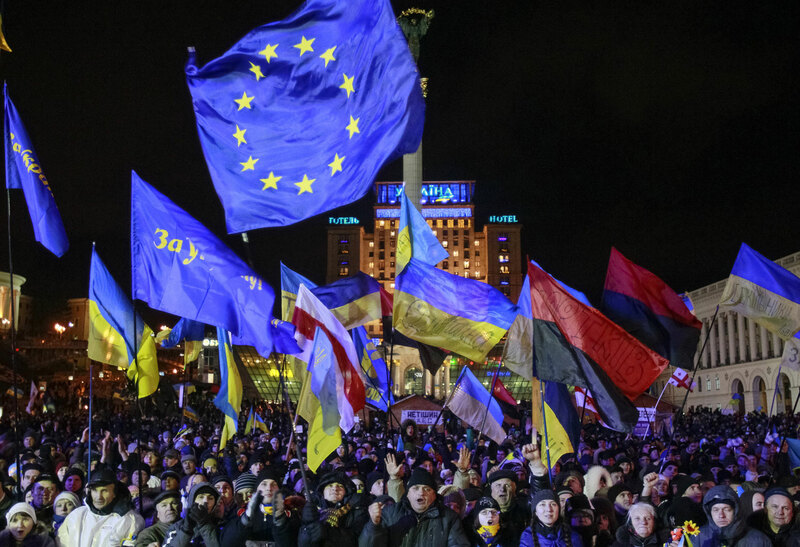 President Obama and Kerry ought to urge the EU to rejigger the offer to Ukraine, tell Russia that they are willing to meet them halfway, and work out a Solomon-like solution that gives everyone a win-win. For while there are many factors impelling Ukrainians into the streets these days, the most basic question at issue in the confrontation between the protesters and the government of Viktor Yanukovych is this: Will conscience, tethered to moral truth and ordered to the common good, be permitted a place in the Ukraine of the 21st century? Or is Ukraine condemned by history, by geography, and by the toxic aftereffects on its culture of seven decades of Communism to be an outlier or exile in the contemporary drama of freedom, governed by brute force detached from any notion of moral responsibility? Before this becomes Axis of Evil Revisited, Obama needs to reign in Kerry and Nuland and calm things down.